Of all the photographs in the slide shows reviewing the last decade, this surely was one of the more perfect images. 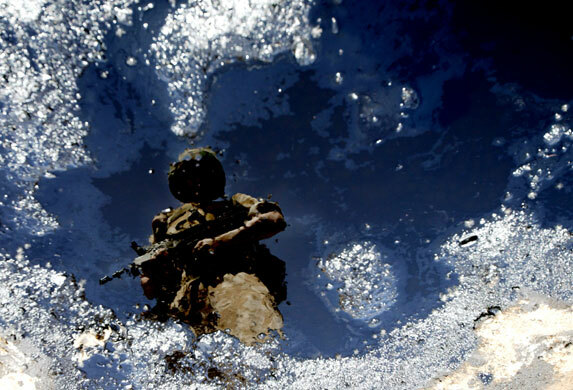 A British soldier is reflected in a pool of oil near Basra, Iraq. Because the individual soldier’s face is lost in shadow while his body is fused visually with the oil, the image seems made for allegorical reading. It was all about the oil, right? (If only that were true, for then the costs of extraction might have been considerably lower.) Political meaning certainly is embedded in the photograph, but there is much more there as well. Most important, I think, is the sheer beauty and artistic quality of the image. The deep blue, which you can’t help but see as both sea and sky, and the brilliant crystals of sand that could be both islands and clouds, and then the terrible complication of the soldier emerging out of the blue liquid like an apparition, like some petrochemical genie awaiting a command. . . . The sense of the photograph is that these elements have coalesced for more than any instrumental reason: no, they reflect a much deeper and more powerful hold on the imagination. Audiences in the US have been lining up throughout the holiday break to see the film Avatar, in which an indigenous people living close to nature defeat high-tech, mechanized, military contractors serving an extraction industry that will stop at nothing to maximize profits. Again, the allegory is all too obvious, and the fact that the beautiful people are blue doesn’t hurt either. For all the New Age styling of the Noble Savage myth, the film presents war as unquestionably the means by which both individuals and peoples achieve dignity and security. In the movie, as in other images such as the one above, war proves capable of aligning itself not only with rational self-interest, prudent adaptation, or any other virtue, but also with beauty and all it can represent. As Chris Hedges noted, war is a force that gives us meaning, and it will stop at nothing to do so. The photograph above is an image of a reflection. “Avatar” refers to an incarnation of a Hindu god, a personification of a concept, principle, or attitude, or a virtual representation of a person. The soldier in the photograph can channel each sense of the term–particularly if you run the logic in the other order, as it actually does run from person to war to the deification of war as a force fused with the power of nature. War, beauty, and photography are all forces that give life meaning. They are not the same force, however, and one challenge at this moment in the 21st century is to see how war is capable of capturing other dimensions of human experience that could be used to stop it. Photograph by Dan Chung/Guardian, from Pictures of the Decade at Guardian.co.uk. Haven’t seen the movie yet – going tonight, if we can get tickets. This photo is amazing. I love the concept of the Avatar, especially now that so much communication between people is done via avatars – e.g., via instant messaging and social media, both of which require users to create digital personas, then have those personas interact with other personas. Seeing digital projections of people’s self-images (not just the photos that accompany their profiles, but also the profiles themselves, which are a collection of selectively chosen “facts” about a person that are presented as a complete, accurate, and transparent representation of them) is endlessly fascinating. Then, of course, there’s the fact that so many religious, literary, propaganda, etc., figures are essentially avatars for concepts, virtues, and so on. I think you can learn an awful lot about what “War” is or what “America” (or “Canada”, or anywhere else) is or what “Good” is by studying what their avatars look like. Nothing I say here is meant in any way to diminish the value, intensity, impact, or beauty of the picture. And I admire your analysis of the image. But I have a couple technical items to address. 1/ Am I missing something, or has this image been flipped — that is, rotated 180? The only alternative I can imagine is that the picture was taken through a lens in the soldier’s helmet. 2/ The author of “War Is A Force…” is Chris Hedges, not Hodges. Phil: Thanks for correcting the typo (which I’ll change in the text). And, now that you mention it, I have no clue how the photographer got that image.